We live a few hours away from some amazing apple orchards. 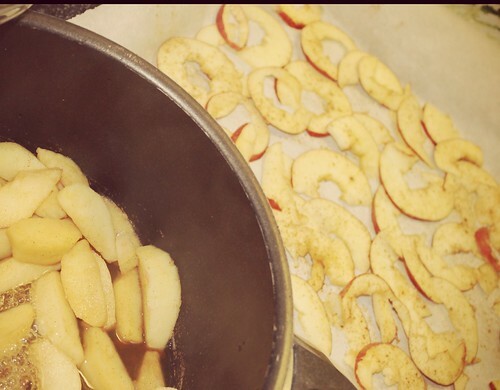 Every autumn we gather up a bunch of apples and bake some of our favorite recipes. It has always amazed me to see how much sugar people add when baking in their own homes. These two traditional recipes are fantastic and sweet enough without sugar. The cinnamon gives them a little added flavour and the kids will LOVE them! Preheat oven to 200 degrees. Thinly slice apples (I cored them but then made them again and you can just remove the seeds). Place on a baking sheet lined with parchment paper. Sprinkle Cinnamon over apples. Bake for 1 hour. Carefully turn the apples over and bake for another 30-60 minutes until the apples begin to brown and the moisture is gone. DISCLAIMER: I don’t know how these taste once they have cooled off. We have never managed to have any leftovers after taking them out of the oven! This entry was written by Melissa, posted on September 30, 2012 at 11:35 pm, filed under Feeding Weaners & Families and tagged apple recipes, autumn recipes, healthy eating, kids cooking. Bookmark the permalink. Follow any comments here with the RSS feed for this post. Both comments and trackbacks are currently closed.